Solvang is a picture postcard of an old-world Danish village plunked down amid the ranches and vineyards of sunny Southern California’s Santa Ynez Valley. The village was founded in 1911 by Danish immigrants to the U.S. who traveled west to escape frigid Midwestern winters. The residents’ notion of creating a traditional Danish village took hold after World War II and evolved into one of California’s best-known tourist attractions. With its half-timbered building facades, old-fashioned windmills, and proliferation of Danish bakeries and gift shops, Solvang is steeped in charm with a dose of kitsch. 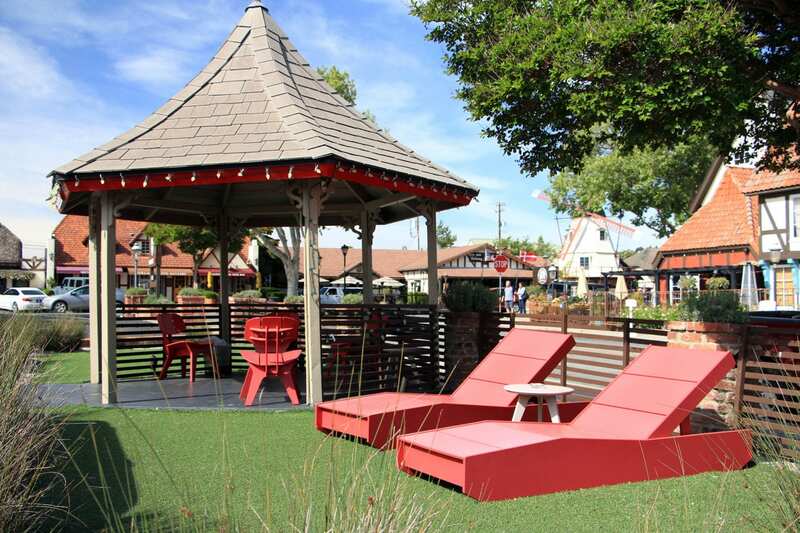 But more recently, Solvang has added a layer of Scandinavian cool with modern boutique hotels cropping up along with chef-helmed restaurants and great wine. 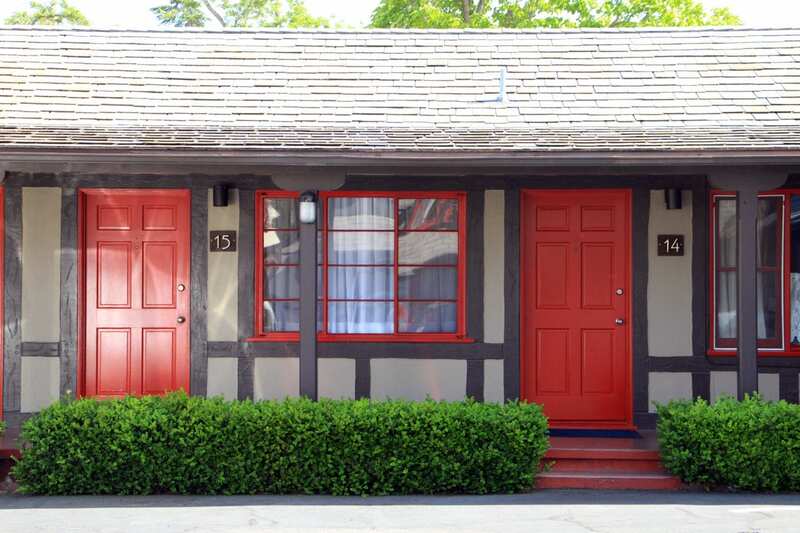 The Hamlet Inn is a roadside motel turned budget-friendly hipster haven in the heart of downtown Solvang. 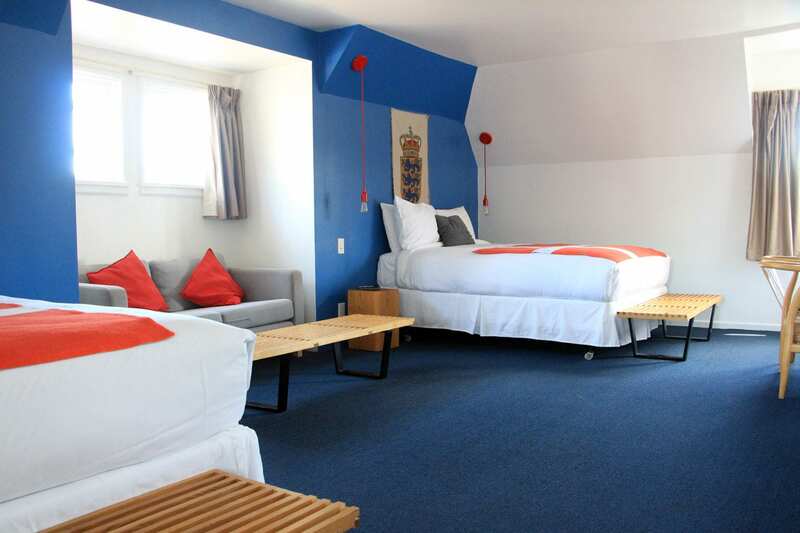 Updated in 2011, the Hamlet Inn offers 15 basic but colorful guest rooms with modern Danish furnishings. 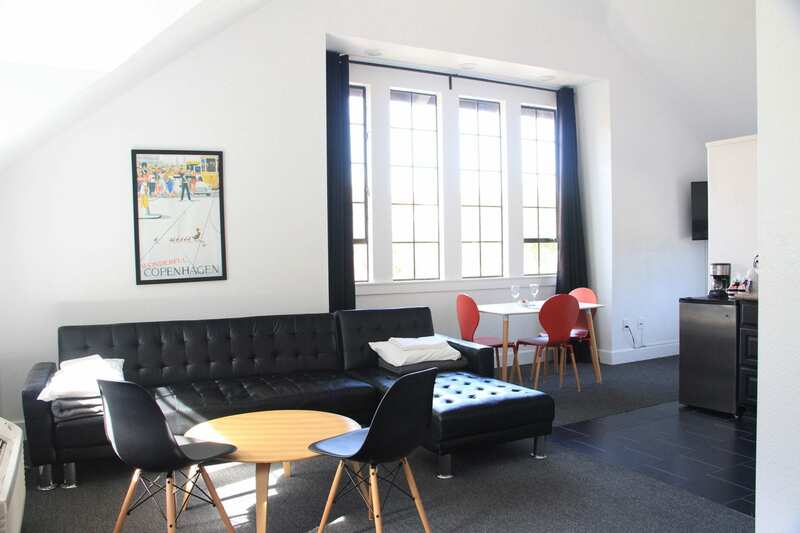 The rooms feature Hans Wegner-style wishbone chairs, slatted wood coffee tables, contemporary gray couches, red pendant lighting with exposed filament bulbs, and electric blue accent walls. 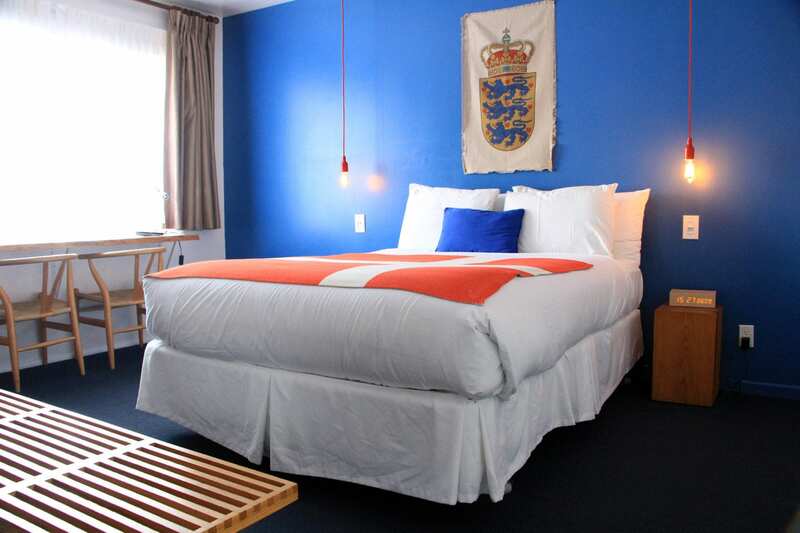 In a more obvious nod to the town’s roots, the beds are draped with Danish flag-inspired throws and banners displaying Denmark’s coat of arms decorate the walls. The bathrooms are simple, motel-style baths, but have been updated with white subway tiled showers. Amenities include free wireless internet and free parking. Outside, guests can challenge themselves to a game of bocce ball or just chill in the outdoor gazebo. 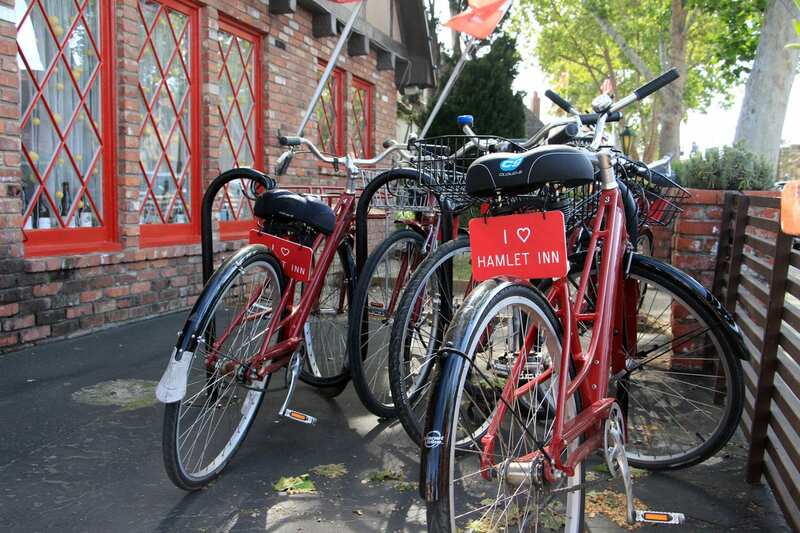 Guests can also take a spin around town with one the inn’s complimentary bicycles. Olsen’s Danish Village Bakery is located directly across the street; many more bakeries, cafes, shops, and wine tasting rooms are within an easy stroll of the inn. 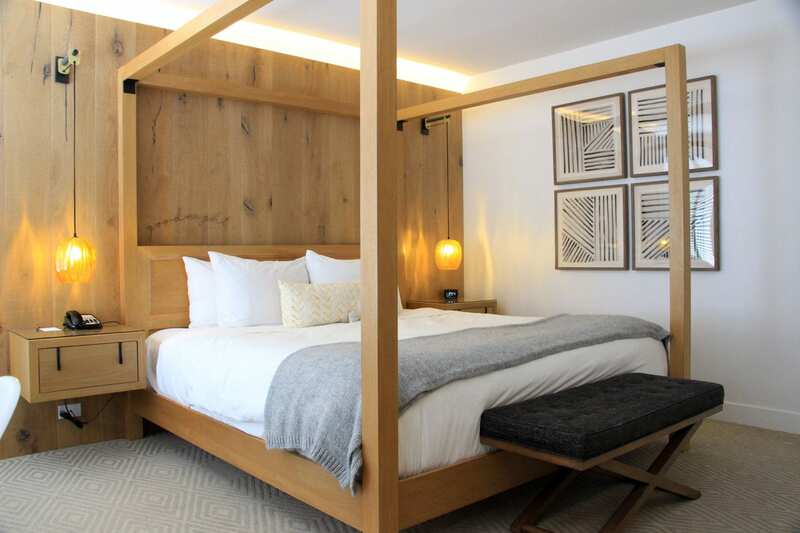 Just a block away, the former Petersen Valley Inn was completely revamped in 2015 as The Landsby with a sophisticated Scandinavian lodge aesthetic. 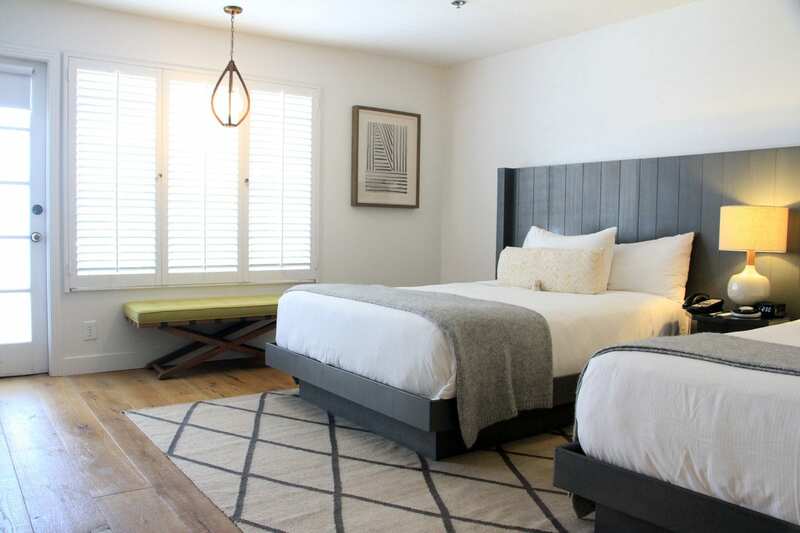 The boutique hotel’s bright and airy guest rooms are finished with blonde woods, brushed brass fixtures, leather accents, and warm, handcrafted furnishings. The rooms are decorated in a muted color palette with geometric patterned accents and whimsical artwork commissioned by a regional artist. The hotel’s 50 guest rooms offer several room types ranging from classic and deluxe options to the luxurious, two-story tower suite with a Jacuzzi tub for two, a sitting room with a fireplace and wet bar, and a king bed upstairs. Amenities for all rooms include cozy robes, Keurig coffeemakers, and small refrigerators. 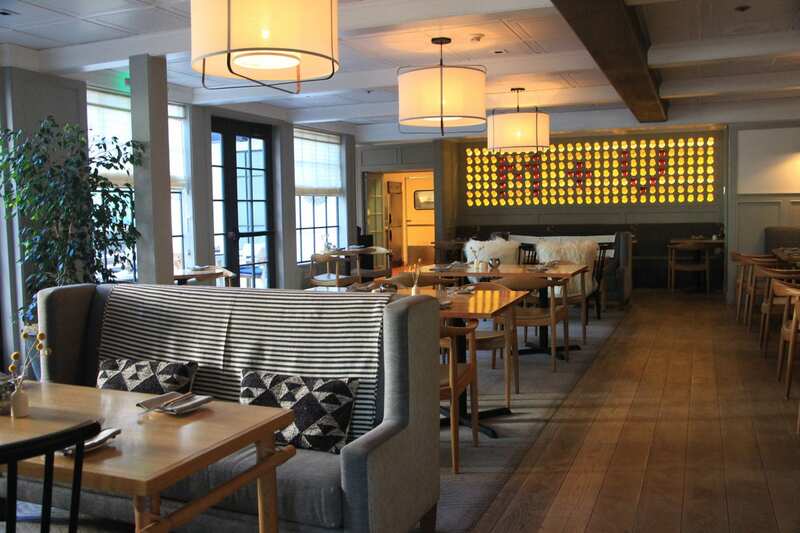 The hotel’s restaurant, Mad & Vin, (which translates to “food and wine” in Danish) specializes in wine-country cuisine made with fresh, seasonal ingredients from California’s central coast. The lobby’s lively bar serves up craft cocktails, specialty shrubs, and local wines. 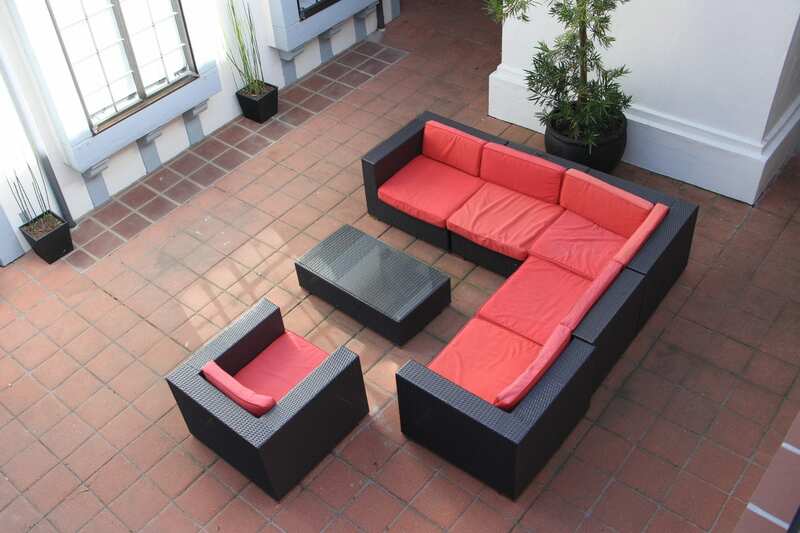 The hotel’s outdoor garden lounge provides a lush oasis for guests to relax with fire pits and romantically lit trees. 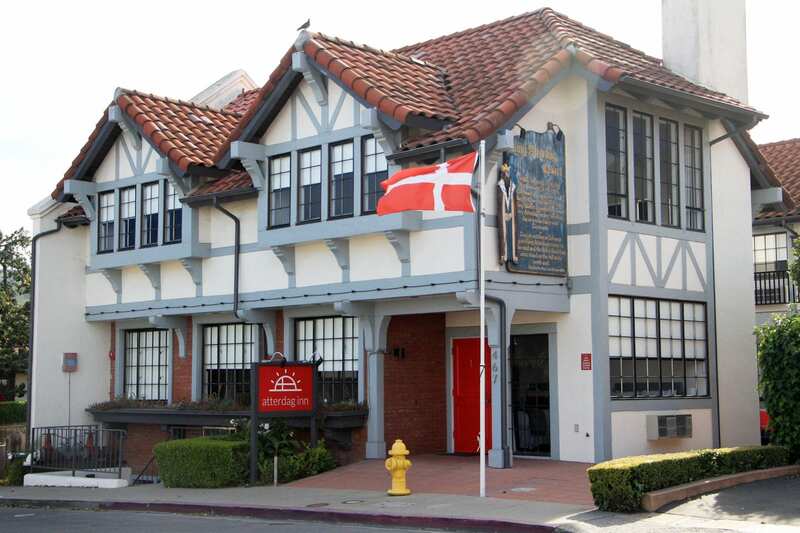 Tucked on a side street just off the main drag, the Atterdag Inn was built in the traditional half-timbered Danish style, but inside, its rooms exude a modern, minimalist Scandinavian aesthetic. The renovated boutique hotel opened in 2015. 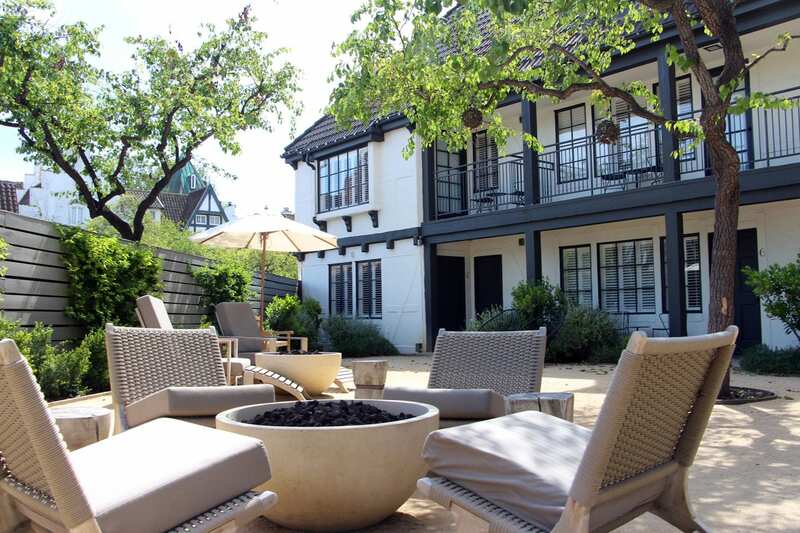 Its eight rooms surround a private courtyard with comfortable outdoor seating. The airy, light-filled rooms feature modern Danish furnishings, whimsical pendant lights, vintage Copenhagen travel poster prints, and a color palette of white and gray with bright red accents. 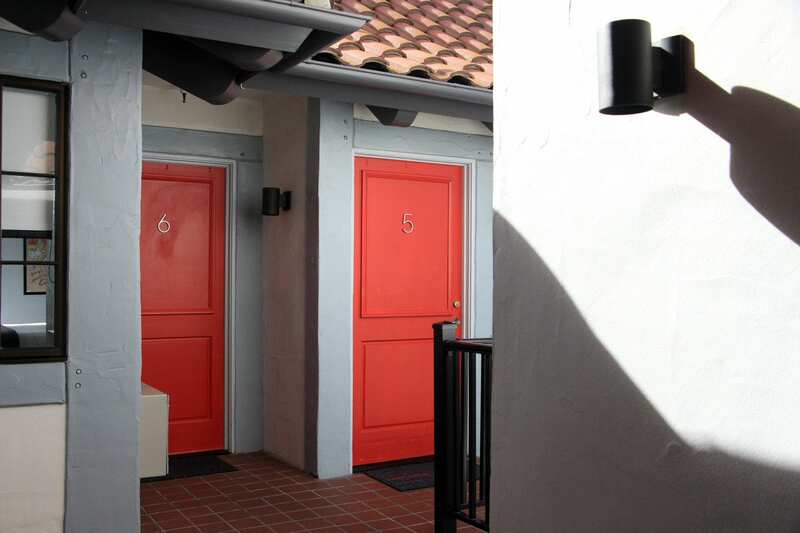 The second floor rooms also offer vaulted ceilings and views of Solvang’s storybook buildings and windmills. 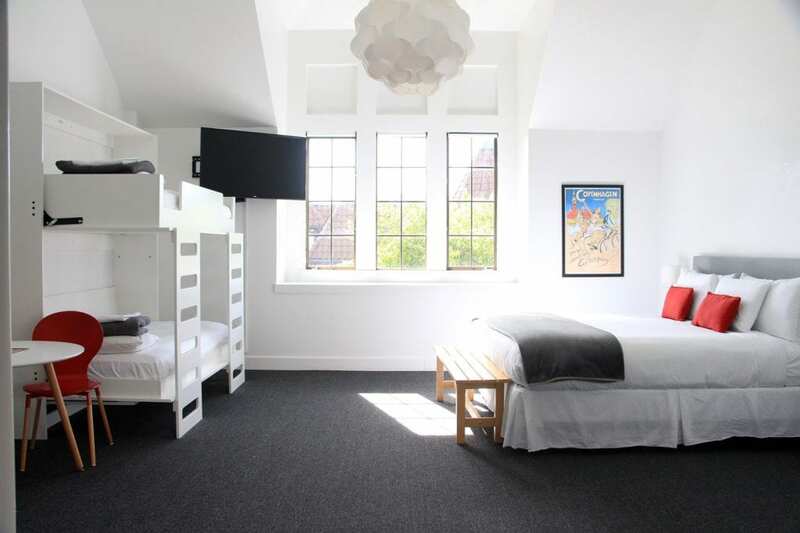 Room 6 is especially appealing for families with bunk beds for the kids and a king bed for the parents. Room 8 is a Deluxe King Suite featuring a black leather sofabed in the living room and a kitchenette. Guests of the Atterdag Inn can enjoy a complimentary continental breakfast each morning at a local Danish bakery. A stay also includes free parking and WiFi. 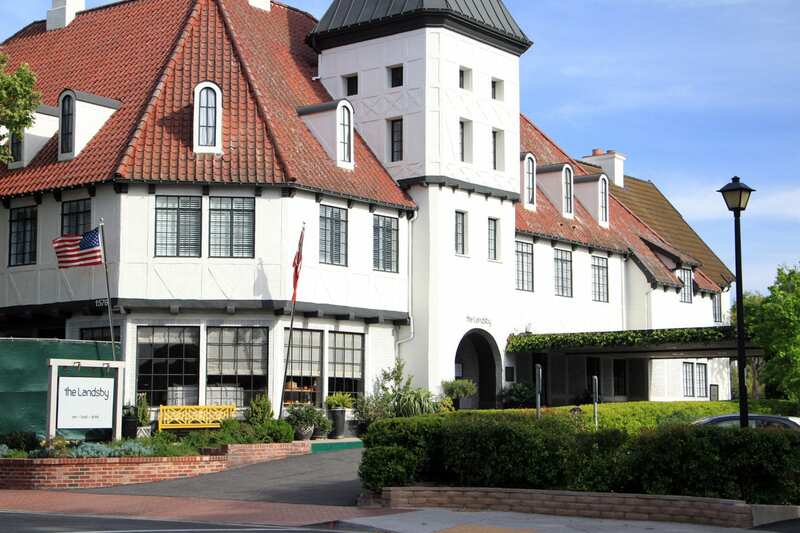 The inn is located within walking distance to many of downtown Solvang’s bakeries, shops, restaurants, and wine tasting rooms.